Apple wins war as Adobe calls time on Flash for mobile | What Hi-Fi? The news, first reported by ZDNet, will be seen as something of a victory for Apple, which refused to adopt Flash on its iPhone and other mobile devices. The email from Adobe said: "We will no longer adopt Flash Player for mobile devices to new browser, OS Version or device configuration." Despite failing to get Flash support on iOS, Adobe did work with Android and other platforms, and pledged to offer ongoing support. "We will continue to support the current Android and PlayBook configurations with critical bug fixes and security updates." Adobe will now be focusing on apps, desktop browser content and HTML5. 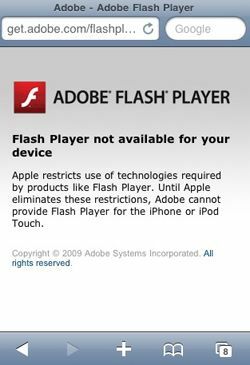 Flash was seen as unstable on mobile devices by many people, most famously Steve Jobs, who posted the infamous 'Thoughts on Flash' essay on the Apple website. Follow whathifi.com on Twitter.Join us on Facebook.